No one American athlete, in any sport, has ever summed up the values of his era more than the pitcher Christy Mathewson. This "Greek God in flannels," as the publicists liked to call him, appeared on the major-league diamond, during the first years of the 20th century, as if in answer to the national yearning for a gentleman-hero. Baseball gloried in its rough-necked, hard-drinking, roustabout spirit when Mathewson first stepped upon its muddy fields. "He handed the game," wrote dean of sportswriters Grantland Rice, "a certain...indefinable lift in culture, brains, personality." In our tumultuous times filled with steroids, gambling and drugs where is our gentleman-hero? 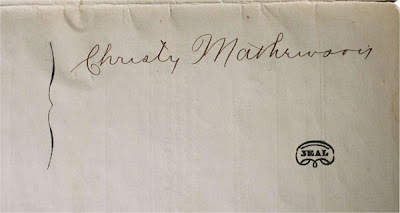 Where is our Christy Mathewson? Mastro Auctions: Swords, Trophies And Dresses... Oh My! Some very unique items went up for sale during the recent Mastro December premier auction a few days ago, including this Civil War 1861 Eagle Base Ball Club Sword. This rarefied artifact combines the genesis of the National Pastime with the rise of the internecine war that nearly sliced our country in half. It was the War Between the States, after all, that dispersed and popularized baseball, transforming it from a regional, little-known game to a bona fide national phenomenon. The new-fangled sport was enjoyed at encampments, on battlefields, and in prisons. It was a shining light of brotherhood and spirited competition for men whose lives were otherwise filled with bloodshed, rot and death. This is one of only three swords known to exist. 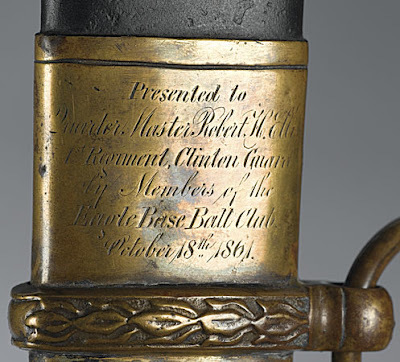 It was formally presented to Union soldier Robert H. Ellis from the Eagle Base Ball Club of New York. 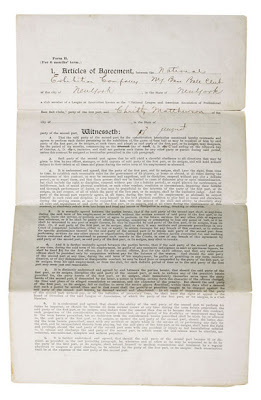 The Eagles had formed as a "town ball" team back in 1840—preceding even the origin of the now-hallowed Knickerbockers—and by 1852 had converted to playing the more formalized "base ball" with other organized clubs. In 1857, the Eagles met the Gothams in a formative championship at Hoboken's fabled Elysian Fields. Their great match was depicted in the publication Porter's Spirit of the Times as one of the first-ever woodcut engravings with a baseball theme. Below is a Puerto Rican Winter League trophy presented to the great Roy Campanella for leading the league in home runs in the 1939-40 season. This originally came from the Campy Estate and stands 13 1/2 inches tall. It sold for $3,616.00. Baseball cabinet photos are very hard to come by. Especially in this condition. 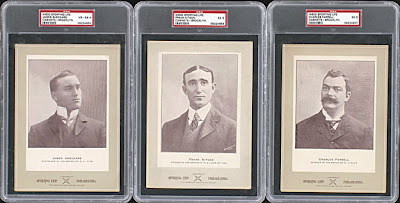 What makes these extra special is that all 3, 1902-1911 W600 Sporting Life Cabinet Photos, are of members of the Brooklyn Superbas (who would later become the Dodgers) - Charles Farrell, Frank Kitson, James Sheckard. They sold for $2,716.00. 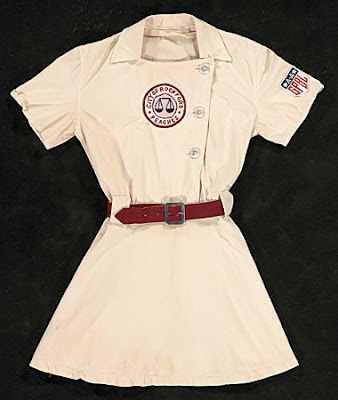 from the family of AAGPBL player Helen Filarski, who in all likelihood had visited the film set and received one of Davis' uniforms.